There's a debate about where or not Vintage Sunglasses with Clear Lenses should be called sunglasses at all. Well, the fact is that Vintage Sunglasses with Clear Lenses still block out harmful UV sun rays... and that's a good thing! Clear lenses do not block out the glare, but they do protect the health of your eyes. It's comforting to know that in this day and age, you can be healthy and fashion-forward. And most women will tell you that it's hard to have cutting age fashion while still being envirionmentally and socially conscious... let alone, conscious of your own health! But with Vintage Sunglasses with Clear Lenses, you can have it all. 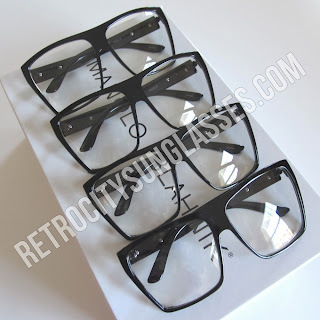 Vintage Sunglasses with Clear Lenses give you that cool hipster look while still protecting your eyes!